Anorexia can be caused by two different modes, it may be due to a clinically important pathological condition, metabolic disorder or pain, or it may be due to less important habitual or environmental factors. In either case, dog anorexia may be partial or complete. Different disorders of the gastrointestinal tract, including bacterial and viral infections, parasitic infestations, nutritional or metabolic disorders like bloating, constipation etc., are considered to be the most common causes of anorexia in dogs. Associated organs of the digestive system, i.e. liver (hepatitis), gall bladder and pancreas, if they have any problem in functioning, can cause severe anorexia. Functioning and/or secretions of these organs usually are controlled by the hypothalamus (part of the brain) that controls the nervous system. Some respiratory problems in dogs, such as kennel cough and asthma can leave dogs with anorexia. Renal diseases and kidney infections can cause canine anorexia, and in case of calculi ((canine bladder or urinary tract stones), dogs may not like to eat, due to severe abdominal pain. Stress due to some medications, environmental factors and some dietary problems, may also be a reason for anorexia in dogs. A dog may be either partially anorectic or completely anorectic. The level of anorexia should be calculated in order to assess the dog's condition and the severity of the problem, but also as a way to define a plan for symptomatic and supportive therapy. If a dog eats food, but not enough to provide at least 40Kcal/Kg B.W of energy a day,such dogs should be labeled as “Partially Anorectic”. It should be noted that a dog could not be termed as partially anorectic, if the dog is just choosier during feedings. Additionally, some breeds of dog’s bodies prefer to consume body fats first, and then take in food. A dog can be labeled as a “Complete Anorectic”, if it does not take in any food for at least 36 hours. Usually, dogs with anorexia, after 48 hours, are labeled with a condition; which is referred to as a “Medical Emergency”. Anorexia, as a symptom, can be diagnosed by the clinical signs, feeding history and a precise calculation of how much food is consumed. Determining the underlying causes of anorexia requires a thorough physical and laboratory examination. Detailed blood tests, urinalysis, respiratory swab examinations, radiography for some kinds of underlying tumors or abnormalities are some procedures a veterinarian may recommend, depending upon clinical signs and history. Some tests other than these may also be required, depending upon the results of earlier tests. 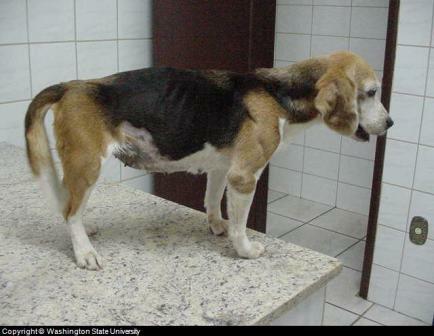 Dog anorexia should be precisely calculated and symptomatic treatment options should be decided; thereafter. Fluid therapy, adjustments of diets, adding flavors and warming dog food, or using appetizers prior to feeding can be some useful techniques for determining mild or partial canine anorexia. In severe conditions, tube feeding, intravenous administration of nutrients and forced feeding can be required. Fluid therapy, by 5% Ringer’s lactate, combined with nutrients, vitamins, minerals and glucose can help in restoring body conditions, when dogs have been diagnosed with complete anorexia. Underlying causes of anorexia in dogs should be treated in order to restore the health of a dog. It is highly recommended that systemic and symptomatic treatments be applied simultaneously. Supportive supplementation can help in quickening recovery.